1 Separately, blitz the blanched almonds and breadcrumbs in the small bowl of a food processor until ground as finely as possible; set both aside. 2 Beat together the butter and sugar until pale. Add the orange zest and beat very well. Mix the flour and the reserved ground almonds and breadcrumbs into the butter mixture to form a softdough. 3 Roll the dough in a sheet of baking parchment to make a sausage roughly 3.5cm in diameter. Seal the sausage in the parchment and refrigerate overnight. 4 Preheat the oven to 150˚C, gas mark 2, and line a baking sheet with baking parchment. Trim the ends of the shortcake sausage and cut into 18 biscuits, about 0.3cm-thick; lay them on the parchment. Bake for 12-15 minutes, until golden. Leave to cool and become crisp. 5 When ready to serve, lightly whip the cream to soft peaks. Apply a comma of cream to each plate and sit a shortcake on top. 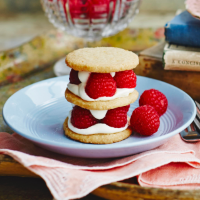 Top with a generous spoonful of cream, a few raspberries and a sprinkling of sugar. Apply another spoonful of cream and add another shortcake. Repeat with a second layer, then serve.